5 Why Might Grammar and Processing be Logical? Philosophy of Linguistics investigates the foundational concepts and methods of linguistics, the scientific study of human language. This groundbreaking collection, the most thorough treatment of the philosophy of linguistics ever published, brings together philosophers, scientists and historians to map out both the foundational assumptions set during the second half of the last century and the unfolding shifts in perspective in which more functionalist perspectives are explored. 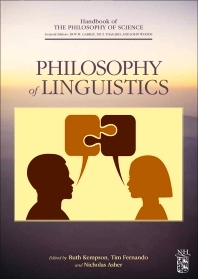 The opening chapter lays out the philosophical background in preparation for the papers that follow, which demonstrate the shift in the perspective of linguistics study through discussions of syntax, semantics, phonology and cognitive science more generally. The volume serves as a detailed introduction for those new to the field as well as a rich source of new insights and potential research agendas for those already engaged with the philosophy of linguistics. John Woods, University of British Columbia, Canada.